I Love You, Man (originally titled Let's Be Friends) is a 2009 American comedy film directed by John Hamburg and written by Hamburg, based on a script previously by Larry Levin. The film stars Paul Rudd as a friendless man looking for a best man for his upcoming wedding. However, his new friend (Jason Segel) is straining his relationship with his bride. The film was released theatrically in North America on March 20, 2009, to mostly positive reviews. It opened second at the box office next to Knowing, and was a modest hit, grossing $91 million on a $40 million budget. This movie marks the third collaboration between Jason Segel and Paul Rudd, who had worked together on Knocked Up and Forgetting Sarah Marshall previously. Peter Klaven (Paul Rudd), a Los Angeles real estate agent, proposes to his girlfriend Zooey Rice (Rashida Jones), and she accepts. Peter seems to not have any close friends to share the good news with, only family and mainly female acquaintances. After overhearing Zooey's friends voicing their concerns over his lack of close male friends, Peter decides that he needs to find male friends in order to have a best man for the upcoming wedding. Peter turns to his gay younger brother, Robbie (Andy Samberg), for advice on dealing with men. He makes a series of overtures toward various men, including Barry (Jon Favreau), the persistently hot-headed husband of Zooey's friend Denise (Jaime Pressly) who doesn't really like Peter all that much to begin with...a problem that only escalates when Peter inadvertently projectile-vomits on Barry after winning a beer-drinking contest and is kicked out of Barry's house. Feeling rejected, Peter is about to give up, when during an open house at Lou Ferrigno's mansion which Peter is trying to sell, he meets Sydney Fife (Jason Segel), an investor who is attending the show simply to pick up divorced women and take advantage of the free food. The two quickly become friends, especially bonding over their mutual adoration of the progressive rock band Rush. Peter introduces Sydney to Zooey at their engagement party, but the meeting takes an unfortunate turn when a nervous Sydney makes a very awkward toast. The next night, Peter agrees to attend a Rush concert with Sydney, on the condition that he can bring Zooey. During the concert, Zooey is left feeling ignored by Peter and Sydney. The next day, while shopping for tuxedos, Sydney asks Peter why he is marrying Zooey, and also asks for an $8,000 loan. After some thought, Peter decides to lend Sydney the money, and later grants him the honor of being best man at his wedding. Zooey, meanwhile, has become suspicious of Sydney. Peter tells Zooey that he lent Sydney money and asks her if she knows why they are getting married, since he had no answer to Sydney's question. (He wasn't aware that it was a question that was supposed to stay between him and Sydney.) Hurt and angry, Zooey leaves. Peter leaves for work the next morning only to discover that Sydney has used the $8,000 loan to purchase several ridiculous billboard advertisements promoting Peter's real estate business (using pictures of Peter he took of him on his iPhone). Still upset over his fight with Zooey, Peter confronts Sydney and decides to end their friendship. Peter then patches things up with Zooey, explaining to her that while he is nervous, he is ready to get married. While Zooey and Peter prepare for the wedding, Sydney finds himself alone and desperate to hang with someone. At work, Peter discovers that Sydney's billboard advertising campaign was successful, as he won back the right to the lucrative Ferrigno listing and many others left messages wanting him to sell their houses. Feeling encouraged, Peter finally stands up to his insufferable colleague, Tevin Downey (Rob Huebel), who had been badgering Peter for half the selling rights to the Ferrigno property (both to help him and to get in on the commission). When Tevin makes one final attempt to get a piece of it, Peter slaps him across his face and tells him to stay away from it. Peter feels bad about fighting with Sydney but does not re-invite him to the wedding. Instead, he assembles an array of random groomsmen that includes Robbie, father Oswald (J. K. Simmons), and Ferrigno. Before the wedding, Zooey sees Peter looking forlorn, clearly missing his friend Sydney. She calls and invites Sydney, who is, unbeknownst to them, already en route to the wedding. Just before the vows are to be taken, Sydney makes a dramatic entrance via moped. He informs Peter and Zooey that he is, in fact, a successful investor and returns the money he borrowed from Peter, stating that the billboards were the couple's wedding present. Peter and Zooey declare their love to each other, Sydney assumes the role of best man, and the wedding commences. Jon Favreau, Jaime Pressly, Jason Segel, John Hamburg, Larry Levin, Rashida Jones, and Paul Rudd at the premiere in Austin, Texas in March 2009. OK Go as The Wedding Band "Tastes Like Chicken"
The script, Let's Be Friends, was originally written by Larry Levin. It was purchased but went unused for about 11 years before the film was made. Hamburg was offered the script and kept turning it down, but after his friends moved to Los Angeles he was inspired by the experience of trying to meet more friends to give it a shot. When Hamburg finally took the script he rewrote it to make it as real as possible. The film was originally announced in December 2007, with production originally scheduled for March 2008. In March 2008, Variety revealed that producer Ivan Reitman's Montecito Pictures officially began production on I Love You, Man during the week of March 31, 2008. I Love You, Man is the third collaboration between Paul Rudd and Jason Segel, following the Judd Apatow projects Knocked Up and Forgetting Sarah Marshall, while writer/director John Hamburg previously worked with Segel on Apatow's Undeclared television series. It only took one lunch to get Segel and Rudd to sign on to do the film and this set the stage for other actors to sign on. On February 13, 2008 it was announced that Rashida Jones would be in the female lead opposite Rudd. Later, in an interview with FirstShowing.net, Jones revealed that because Segel and Rudd were already attached to the project she "knew immediately that it was gonna be even funnier than I would think." At the beginning of the March 31, 2008 week, The Hollywood Reporter announced that Jaime Pressly had joined the film's cast, playing the best friend of Rashida Jones' character. Hamburg comically stated that he was lucky in casting J.K. Simmons because his contract states "he has to be in one out of every four movies made." Jon Favreau started working on the film the same week Iron Man came out, a film which he directed. He said he "probably wouldn't have agreed to have done it had I known my life was going to be that shape", but Iron Man star Robert Downey, Jr. told him that "It is the best thing you could do" – he said 'chop wood, carry water,' which is what they do in the Kung Fu movies to keep you humble." One of late President of Egypt Anwar Sadat's daughters filed a lawsuit against the filmmakers because, in the film, Sydney's dog is named after her father. He tells Peter that he thinks "they look exactly alike." Samir Sabri, the lawyer in the case, asked the US embassy to apologize. Complaints have been raised by Egyptian bloggers as well. In the Arab world, "dog" is often used as an insult, and, in the more specific context of Islam, dogs have historically been seen as unclean. Rush were approached by Hamburg, a fan of the band, to appear in the film. The filming schedule was tight because there was a one-day window between two of their concerts on tour. The band later said that they enjoyed the experience. Hamburg felt that "once Rush got that I wasn't poking fun at them, that I'm genuinely a fan and the main characters of the movie are fans and it's kind of a loving tribute to them, I think that's when they came on board." Subsequently, both Rudd and Segel appeared in character as Peter and Sydney alongside the members of Rush in a short video played at the end of concerts during the band's 2010–11 Time Machine Tour. In August 2013, Rudd reprised his character at the final show of Rush's Clockwork Angels Tour, conducting the Clockwork Angels Orchestra (a string section which accompanied the band) during the song "YYZ." In 2015, on Rush's R40 Live Tour, Rudd and Segel were again featured among a number of celebrities in an accompanying rear-screen video lip-synching the rap section to the song "Roll the Bones". I Love You, Man received largely positive reviews, with critics mainly praising the chemistry between Rudd and Segel, as well as the supporting performances. Film review website Rotten Tomatoes gives it an overall approval rating of 83% based on 206 reviews, with an average rating of 6.9/10. The website's critical consensus states, "I Love You, Man makes the most of its simple premise due to the heartfelt and hilarious performances of Paul Rudd and Jason Segel." Metacritic gives it a weighted average score of 70% based on reviews from 34 critics. Giving the film three out of four stars, Peter Travers with Rolling Stone said that despite the formulaic plot, "It's the variations that Rudd and Segel spin on this theme that make the movie hugely enjoyable." He also praised the supporting cast. Entertainment Weekly gave the film an A, and said that "Paul Rudd gives a startlingly funny and original performance." USA Today gave the film a glowing review, stating "the movie works because everything hinges on the camaraderie and undeniable chemistry between Rudd and Segel." More conservatively, People magazine said the movie "sails along on goodwill and blush-worthy bawdiness," but concluded that "like instant chocolate pudding, it goes down easy — even if it isn't especially good for you." The film was not without its critics. Peter Rainer of The Christian Science Monitor was not impressed with the film, and after noting that the character Sydney seemed to be written for Owen Wilson, Rainer remarked, "Maybe Wilson was busy. Lucky him." The Colorado Daily described the relationship between the male leads as a "watered-down false bromance", noting that the pace of their relationship seemed "rushed", and that Peter was looking out for his wife rather than his best friend. In its U.S. opening weekend, the film made $17,810,270 in 2,711 theaters, ranking number two at the box office. The film grossed $71,440,011 domestically and $20,196,975 internationally making $91,636,986 worldwide. I Love You, Man stayed in the box office top ten for five weeks and was number 27 among films released in 2009. The film was released on Blu-ray and DVD by Paramount Home Entertainment instead of DreamWorks Home Entertainment on August 11, 2009 in the US and August 24, 2009 in Europe and as of November 2009 generated more than $22 million in DVD sales. I Love You, Man was ranked number two in sales during its opening week and declined from there. The DVD extras contains an hour and a half of content including a full performance of "Limelight". The film has been nominated for Best Kiss for the 2009 MTV Movie Awards for the smooch between Thomas Lennon's character Doug and Rudd's Peter, but lost to Twilight. It was also nominated for a GLAAD Media Award for "Outstanding Film - Wide Release" during the 21st GLAAD Media Awards. ^ "I Love You, Man (15)". British Board of Film Classification. February 23, 2009. Retrieved October 30, 2016. ^ a b "I Love You, Man (2009)". Box Office Mojo. IMDB. Retrieved March 20, 2018. ^ Vilkomerson, Sara (March 10, 2009). 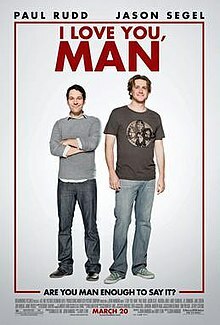 "A Romantic Comedy About Two Straight Men: John Hamburg's I Love You, Man Might Be the First Dude Flick With a Heart". The New York Observer. Retrieved March 20, 2018. ^ a b Douglass, Edward (March 12, 2009). "John Hamburg Says I Love You, Man". ComingSoon.net. CraveOnline Media. Retrieved March 20, 2018. ^ Melissa (March 20, 2009). "SXSW Panel: I Love You, Man: Are You Man Enough to Say It?". SXSW '09 (Press release). SXSW. Archived from the original on March 24, 2009. Retrieved August 28, 2009. ^ Morefoot, Addie (March 10, 2009). "'Man' love in New York". Variety. Penske Business Media. Retrieved March 20, 2018. ^ Siegel, Tatiana (December 10, 2007). "Paul Rudd to star in 'I Love You'". Variety. Penske Business Media. Retrieved March 20, 2018. ^ McNary, Dave (March 26, 2008). "Montecito acquires 'Underage' spec". Variety. Penske Business Media. Retrieved March 20, 2018. ^ "I Love You, Man (2009)". Box Office Mojo. IMDb. Retrieved December 4, 2008. ^ Guerrasio, Jason (March 23, 2009). "Catching Up With... I Love You, Man's Jason Segel". Paste. Paste Media Group. Retrieved March 20, 2018. ^ Siegel, Tatiana (February 13, 2008). "Rashida Jones set to 'Love' Rudd". Variety. Penske Business Media. Retrieved March 20, 2018. ^ Billington, Alex (March 20, 2009). "Interview: I Love You, Man's Lead Actress Rashida Jones". FirstShowing.net. Retrieved March 20, 2018. ^ Kit, Borys. "Jaime Pressly cast in 'I Love You, Man'". The Hollywood Reporter. Archived from the original on April 15, 2008. Retrieved March 20, 2018. ^ Capone (March 23, 2009). "Capone Talks about Guy Stuff with I Love You, Man writer-director John Hamburg!!!". Ain't It Cool News. Retrieved March 20, 2018. ^ metrowebukmetro (April 16, 2009). "Jon gets film advice from Downey Jr". Metro. Retrieved March 20, 2018. ^ "Egypt anger over Sadat film dog". BBC News. BBC. August 5, 2009. Retrieved March 20, 2018. ^ Brunner, Rob (March 17, 2009). "Rush's Geddy Lee talks about 'I Love You, Man,' 'Colbert,' and their new compilation". Entertainment Weekly. Time. Retrieved August 25, 2009. ^ Douglas, Edward (August 10, 2009). "EXCL: John Hamburg Says I Love You, Man... Again!". ComingSoon.net. CraveOnline Media. Retrieved March 20, 2018. ^ Wright, Shauna. "Actor Paul Rudd Joins Rush Onstage at Tour Finale". Ultimate Classic Rock. Retrieved March 20, 2018. ^ "I Love You, Man (2009)". Rotten Tomatoes. Fandango Media. Retrieved July 5, 2018. ^ "I Love You, Man Reviews". Metacritic. CBS Interactive. Retrieved March 20, 2018. ^ Travers, Peter (April 2, 2009). "True Bromance". Rolling Stone. Retrieved March 20, 2018. ^ Gleiberman, Owen (March 27, 2009). "I Love You, Man". Entertainment Weekly. Time. ^ Puig, Claudia (March 20, 2009). "'Man,' this is one bromantic joy ride". USA Today. Gannett Co. Retrieved March 20, 2018. ^ Colorado Daily staff (May 14, 2009). "Kirk and Spock: Tip of the bromance iceberg". Colorado Daily. Digital First Media. Retrieved March 20, 2018. ^ "I Love You, Man". The Numbers. Nash Information Services. Retrieved March 20, 2018. ^ Hoffman, Jordon (August 6, 2009). "I Love You, Man - John Hamburg Interview". UGO. IGN Entertainment. Retrieved November 16, 2009. ^ "21st Annual GLAAD Media Awards - English Language Nominees". Gay & Lesbian Alliance Against Defamation. 2010. Retrieved February 21, 2010.